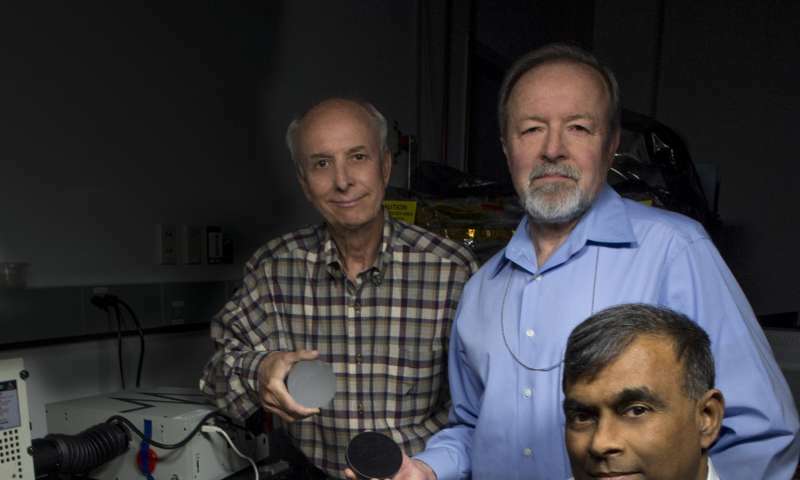 Led by Theodor Kostiuk, a scientist at NASA's Goddard Space Flight Center in Greenbelt, Maryland, the technology-development effort is aimed at giving the scientific community a compact, reproducible, and relatively inexpensive telescope that would fit easily inside a CubeSat. Individual CubeSats measure four inches on a side. Under this particular R&D effort, Kostiuk's team seeks to develop a CubeSat telescope that would be sensitive to the ultraviolet, visible, and infrared wavelength bands. It would be equipped with commercial-off-the-shelf spectrometers and imagers and would be ideal as an "exploratory tool for quick looks that could lead to larger missions," Kostiuk explained. "We're trying to exploit commercially available components." While the concept won't get the same scientific return as say a flagship-style mission or a large, ground-based telescope, it could enable first order of scientific investigations or be flown as a constellation of similarly equipped CubeSats, added Kostiuk. With funding from Goddard's Internal Research and Development program, the team has created a laboratory optical bench made up of three commercially available, miniaturized spectrometers optimized for the ultraviolet, visible, and near-infrared wavelength bands. The spectrometers are connected via fiber optic cables to the focused beam of a three-inch diameter carbon-nanotube mirror. The team is using the optical bench to test the telescope's overall design. 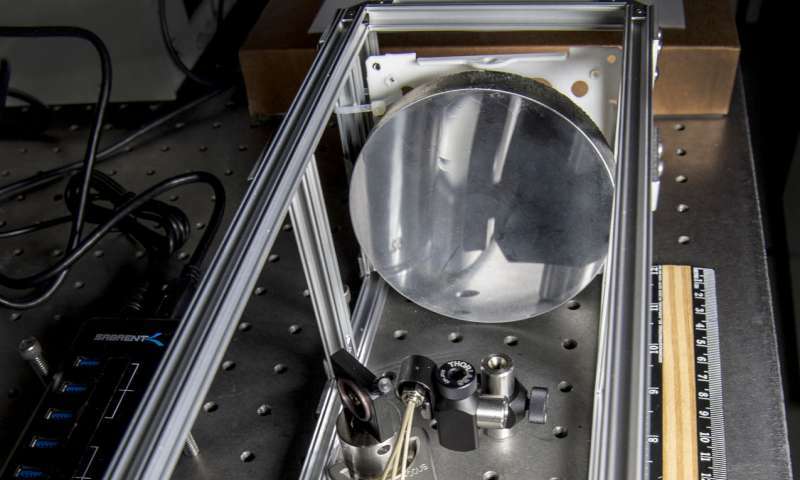 "No one has been able to make a mirror using a carbon-nanotube resin," said Peter Chen, a Goddard contractor and president of Lightweight Telescopes, Inc., a Columbia, Maryland-based company working with the team to create the CubeSat-compatible telescope. "This is a unique technology currently available only at Goddard," he continued. "The technology is too new to fly in space, and first must go through the various levels of technological advancement. But this is what my Goddard colleagues (Kostiuk, Tilak Hewagama, and John Kolasinski) are trying to accomplish through the CubeSat program." The use of a carbon-nanotube optic in a CubeSat telescope offers a number of advantages, said Hewagama, who contacted Chen upon learning of a NASA Small Business Innovative Research program awarded to Chen's company to further advance the mirror technology. In addition to being lightweight, highly stable, and easily reproducible, carbon-nanotube mirrors do not require polishing—a time-consuming and often times expensive process typically required to assure a smooth, perfectly shaped mirror, said Kolasinski, an engineer and science collaborator on the project. "After making a specific mandrel or mold, many tens of identical low-mass, highly uniform replicas can be produced at low cost," Chen said. "Complete telescope assemblies can be made this way, which is the team's main interest. For the CubeSat program, this capability will enable many spacecraft to be equipped with identical optics and different detectors for a variety of experiments. They also can be flown in swarms and constellations." He believes it also would work for larger telescopes, particularly those comprised of multiple mirror segments. Eighteen hexagonal-shape mirrors, for example, form the James Webb Space Telescope's 21-foot primary mirror and each of the twin telescopes at the Keck Observatory in Mauna Kea, Hawaii, contain 36 segments to form a 32-foot mirror. Moreover, carbon-nanotube mirrors can be made into 'smart optics'. To maintain a single perfect focus in the Keck telescopes, for example, each mirror segment has several externally mounted actuators that deform the mirrors into the specific shapes required at different telescope orientations. "This technology can potentially enable very large-area technically active optics in space," Chen said. "Applications address everything from astronomy and Earth observing to deep-space communications."